Dave's wife booked him a trip for his birthday present, and what a present it was. We left the marina at 5:45 and looked for fish for about 15 minutes and finally saw a few to set up on. By 7:45 we had gone through 125 baits and were well on our way to a great day. 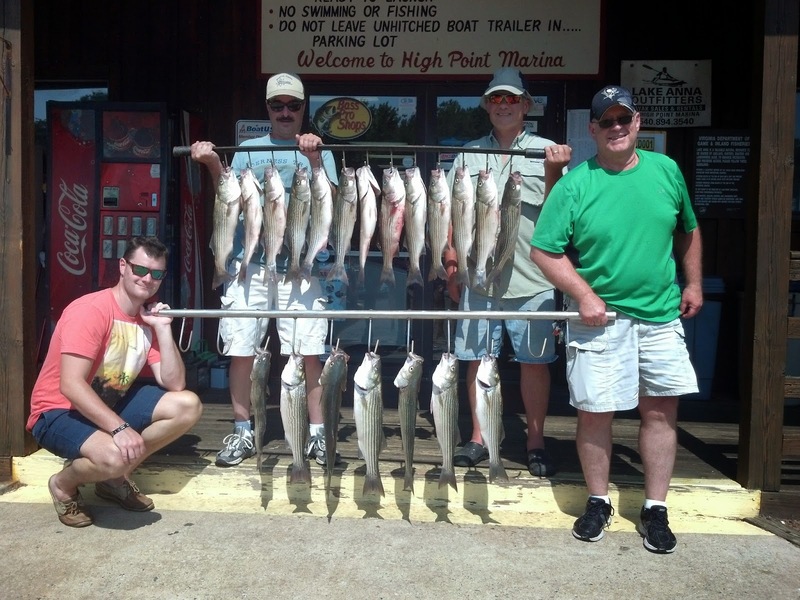 We went back to High Point to get ice for the fish and for the guys to rest a bit. After catching bait we all had to gather ourselves from a story that was told while I was throwing the net. Let's just say that Mark got his man card back when one of the guys told us about a "pedi" that he had received along side his wife. I won't mention who that was but I bet his wife really looks after him on his birthdays. We set up in another area and caught a few keepers then mostly punks. Finally, we found a really nice school of fish and set up on them and nearly went through another 80 baits. By 10:00 we had our limit and called it a day. Looks like there will be a fish fry for the Delta shift at North Anna Power Station. Happy Birthday Dave!!!!! !